This is where I write, when I'm not writing somewhere else. Sunset over the Gulf of Mexico. What’s not to like? Too far, is what I felt, when I looked at the map, trying to figure out the next leg of my journey as I left Florida. 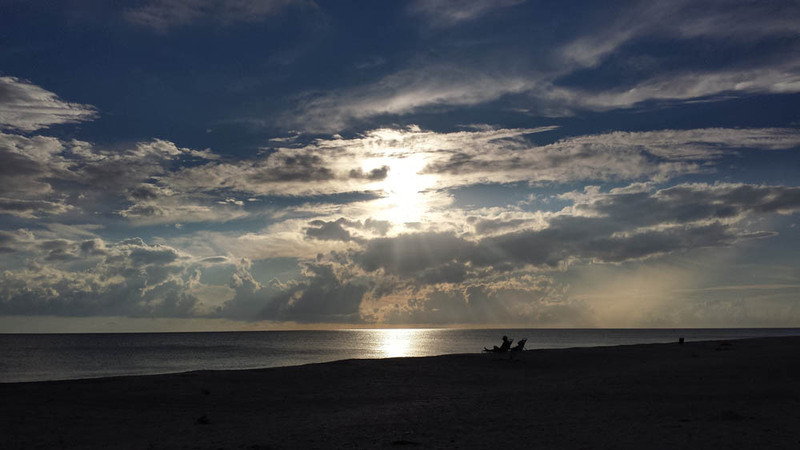 I had a great time on Sanibel Island, almost entirely because of the company. No denying it’s a beautiful place, either. But there’s nothing like hanging out with family you like, and yakking. I think I’ve been missing yakking. Going long days driving with no one to comment to, is, well, a bit like being a tree in the forest falling down. I do think thoughts, and who knows, they may be deep, but by the time I show up at the next motel, well, I’m a bit beat, and not quite in the mood for writing them down. I do record things in my journal in the morning, but I don’t know whether there’s much there of interest either. The days are running together, as are the places. I’m not sure that this is much better than flying, it just takes longer, as far as getting a sense of what each place might be like. I get snippets. Bits of overheard conversation, but I’m not really there, each place I stop at. I do hear occasional uncommentable-upon comments though: Woman in Tallahassee, at the free breakfast (lots of white flour goes into these free breakfasts) commented on the interminable (my feeling, not hers) coverage of the Pope’s visit. “Are you Catholic?” she asked me and another woman in the room. “No,” we both replied. She wasn’t either. But they agreed they like the Pope. They maybe don’t remember (don’t know) that their country was once hugely mistrustful of Catholics (the Irish, Kennedy). “What this world needs is more Christianity,” she said. No comment. I do know when not to yak. I have been listening to the radio, and find myself quite amazed by how different the culture is where I’ve been driving. I mean I ‘knew’ this, but listening to radio, well, it’s sure not Canada. Of course yesterday was Sunday, but I didn’t listen to a lot of preaching in that sense. I did find myself listening to American Family Radio for awhile, which means Christian, consisting of Mom, Pop, and the kids. Anything else is a bit indicative of the Antichrist (Obama). Another day (not a Sunday) I was listening to two women discuss how, while this is a tolerant country, they’re really worried about all those Muslim refugees trying to get into this country (no, they’re trying to get to Europe, I thought) and pondering how suspicious it was that none of them wanted to go to Russia or China or India. No, those Muslim hordes want to come here and irrevocably change the character of this country. So, as a defence, the two women thought it would be a good idea to close the borders for awhile to immigration, to keep out all the Un-American hordes trying to get in. I will say that for awhile I was listening to Prairie Home Companion (liberal socialists, I guess) and they were making fun of the idea of the Wisconsin governor, Scott Walker, who had been running for the Republican nomination, who thought that as well as a wall to keep out all the “illegals” from Mexico, there should be a wall along the Canadian border. I expect geography’s not his strong suit. Garrison Keillor was imagining us Canadians putting up catapults to get over the wall, we’re all so desperate to get in. But then he can probably pick up the CBC, so his thinking’s become warped. I also listened to Ben Carson talking in an interview on a local NPR station a couple days ago, and he talked about how America is great (the greatest, though apparently it’s broken) and he said it’s the only country with a strong national character, unlike any other country in the world. He was talking about Being a Good American. How you can be Un-American (that’s bad of course, and I think involves supporting Planned Parenthood). He said you can’t be Un-Canadian, or Un-Swedish, etc., which I found a very peculiar statement. America is the only place…yada yada, I stopped listening. He has a very reasonable tone to his voice, and incredible credentials which leaves me a bit puzzled as to how he has such radically Conservative views. As a high achieving black man, he doesn’t seem to see any racism in his country either. Interesting. One of the things I thought listening to the preaching on the radio, as I switched stations, trying to find NPR again, was that there was no difference in the tone of voice from those selling God to those selling cars or washing machines. It’s all a hard sell. Turned it off after awhile, and just listened to the sound of the air conditioner in my car, and the tires on the road. You can tell some of the difference of the places you drive through when you drive straight for three days, as I’ve just done, from the sound of the road. First day Sanibel to Tallahassee, roads are pretty good. 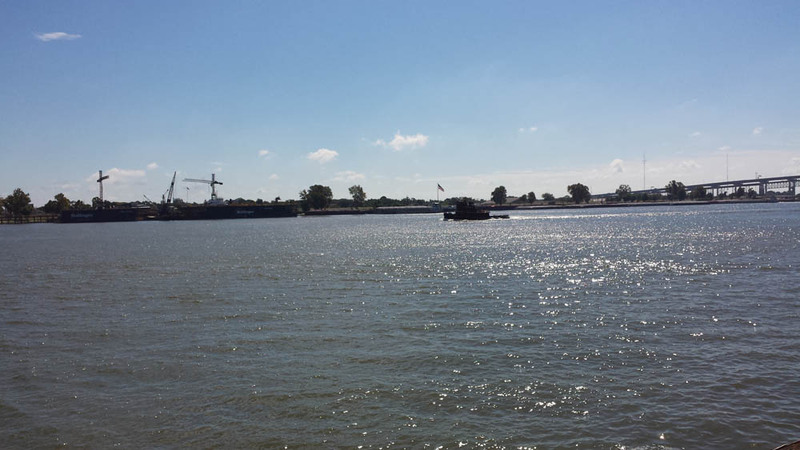 The next day I crossed into Louisiana the road was a lot noisier, and I bounced around a lot more. Also, I swear that the road was steaming. I was close to the Gulf of Mexico of course, and we all know that occasionally it overflows onto the land. In the meantime, well, there’s a lot of swamp. Anyway, the highways in Louisiana weren’t well kept. Not sure why not; there were enough casinos to indicate a fair bit of money flows around. New Orleans. I stayed two nights just outside town, in Metairie, suburb, massive amount of traffic. 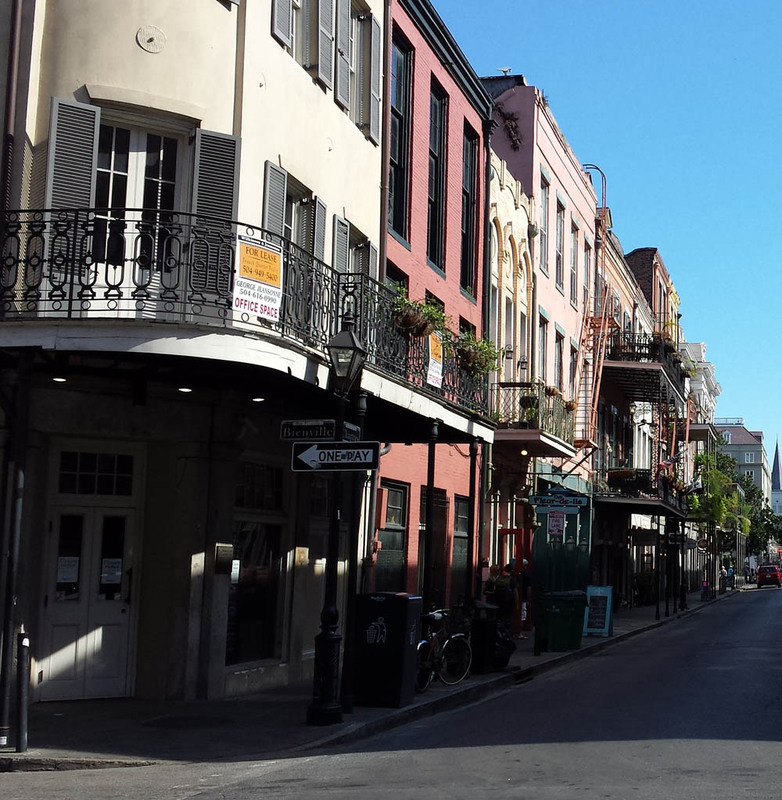 Drove into town to have a wander about the French Quarter. I find I’m there too late in my life. Should have come when I still liked to booze it up all day (oh, I never did, not all day). Certainly I needed company, because I had no desire to be there after dark. But I walked a lot, saw that the French Quarter does indeed look like it does in the movies, and there is music on many corners (with the pot set out to gather donations, fair enough). A thriving web of streets catering to tourists. And tourists everywhere, reminding me of my own status. But I’m a lousy tourist; with all my belongings at home in a storage locker, I’m not looking to fill my bags with stuff. Not a big foodee either, only want to eat when I’m hungry, and only things that nourish me, a bit hard to pull off in most restaurants. And what a sad case to be slogging through New Orleans! I can’t eat peppers, not really, and all the hot sauce does bad things to me. So I walked, along the river for a while, and past a very large casino (I don’t gamble either) and so found the Ogden Museum of Southern Art, which was a good respite, even without the air conditioning. I did stop and have a po-boy sandwich, just so I’d know what one was. Dave Robicheaux always has one (character in many of James Lee Burke’s novels). I had one with fried shrimp, and later had a salad from Whole Foods, back in the ‘burbs, as an antidote. Should have skipped the fries, too much grease. Maybe I don’t think I like driving as much as I thought. 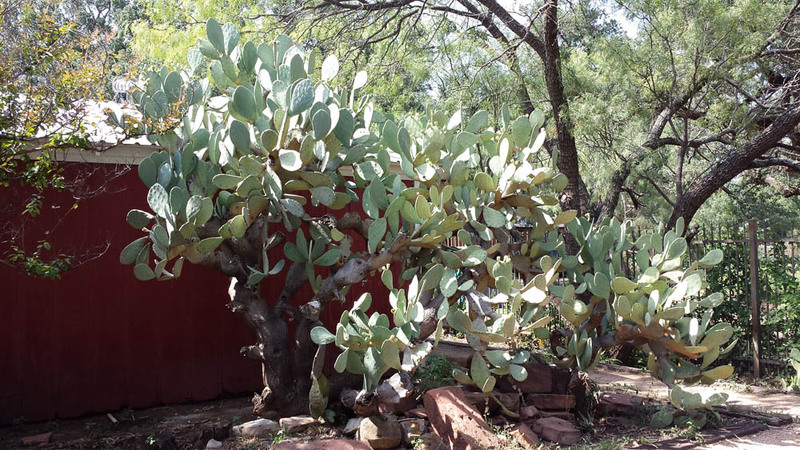 Cactus in Buffalo Gap, Texas. Anyway, secondary highways, or the old routes that the Interstates replace, are tedious too, being endlessly repetitive of gas stations, fast food joints, and Walmart. I blush to admit it, but in Longview Texas, that’s where I picked up dinner, Walmart (a salad and some chicken wings). Next day more Texas, Longview to Lubbock. I did take another slight detour, wanting for some reason to drive by/through Abilene (read a lot of westerns in my early teens). I stopped to be a tourist at the Buffalo Gap Historic Village, just south of Abilene. Two of the buildings are original, the rest have been moved there. Sleepy place, but interesting. Sort of. Lots of guns in the museum upstairs in the old courthouse, original building. Interesting poster explaining about one ‘hero,’ an army guy, who helped slaughter a bunch of Comanche horses, so as to cripple the ‘Indians’ and get them back to their reserve in Oklahoma, and make life safer for the people wiping out the buffalo. Okay, so I read things from a Canadian perspective. I like that we’re about peace and good government. 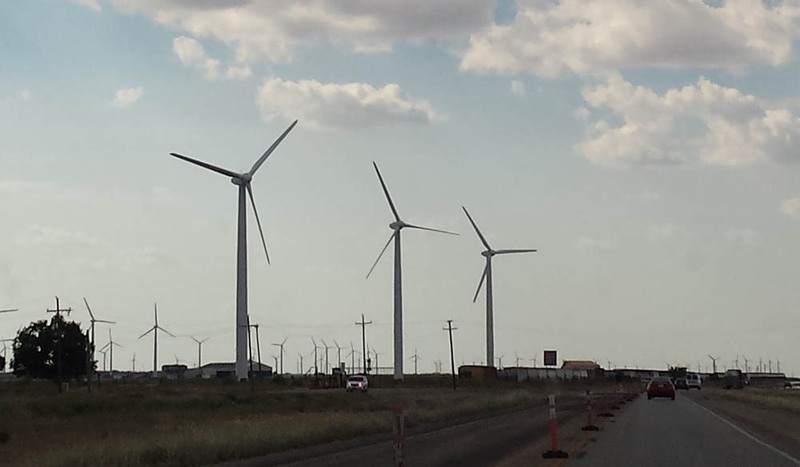 And then many hours along very flat prairies, past gazillions of windmills, and then some oil well pumps, and then across the line into New Mexico. In due course the landscape changed and I found myself in mountains, whew. And now I’m in Taos, and have spent the day writing this, doing my laundry, and poking around stores and galleries (being a lousy tourist, I’m still empty-handed) as well as taking a drive out to look down into the Rio Grande Gorge, which shocks by it’s appearance in the middle of what seems to be flat prairie. Tomorrow I’m off to Santa Fe, where I’ve signed up for a several-day writing workshop at a Zen Centre. I hope to feel very meditative there, and have a pile of pages filled, too. We’ll see. 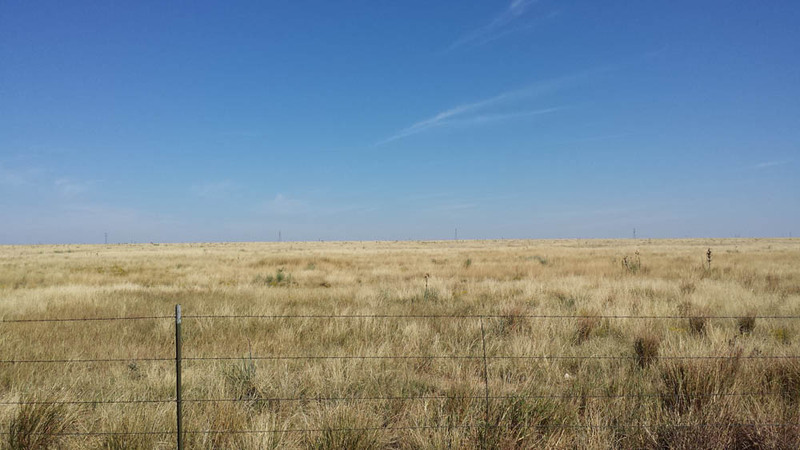 Where the buffalo used to roam, New Mexico. 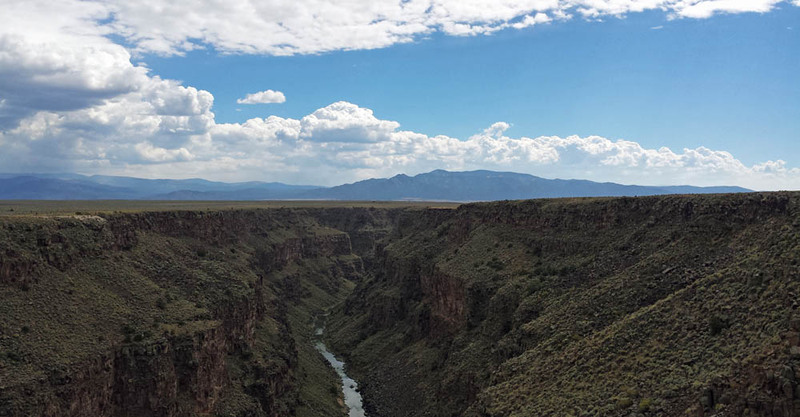 Rio Grande Gorge. Imagine trying to cross that with your wagon train. This entry was posted in driving, life. Bookmark the permalink. “I was listening to two women discuss how, while this is a tolerant country, they’re really worried about all those Muslim refugees trying to get into this country…” Things we ‘tolerate’ are things we put up with but would rather not; it’s a far cry from acceptance or understanding, I think. I mean, I can put up with, or tolerate that pebble in my shoe for a while, but not too long. There’s room for some real humanity in dealing with the impossible position that the refugees are in, instead of all the fear-mongering. So yes, understanding and acceptance. Something that Europe at least is trying to wrestle with. Forgive me if i already sent this. Our cell connection is complicated. This morning we are anchored in Mannion Bay, Bowe Island. You could live here! Well, not IN harbour, since live-aboards are controversial, but within this ring of light and sun. We are going ashore to look for ice, and consider the local cafes.